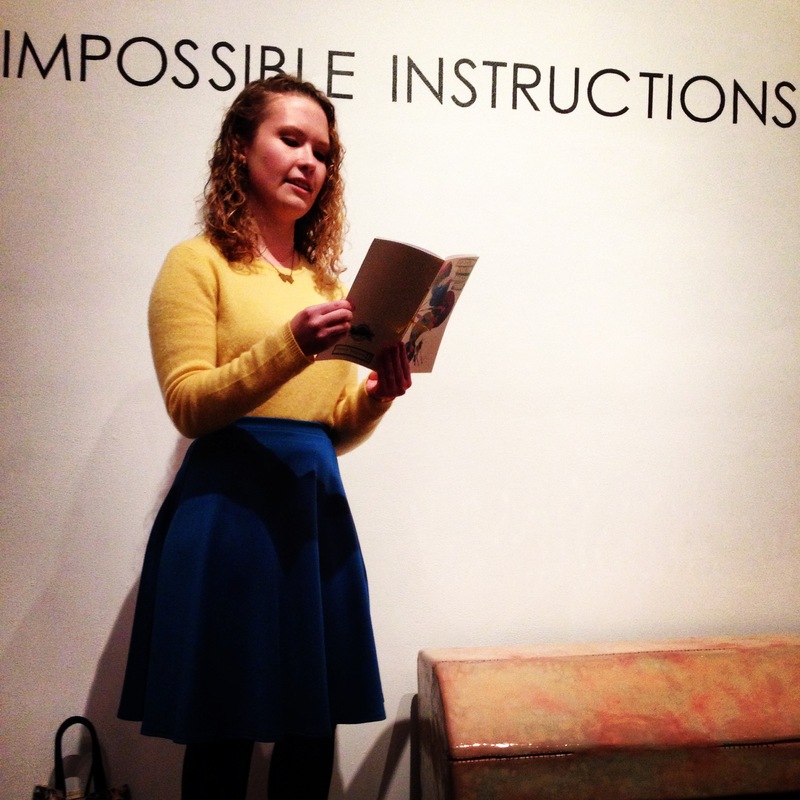 Thanks to everyone who came out to the Impossible Instructions opening earlier this month. The celebration of the exhibit was a success! There is a limited number of chapbooks affiliated with the event available still. Get yours today! The art and writing that came out of this show speaks to the power of collaboration. Deborah Bernhardt read her poetry first, and before she read the poem that inspired the wearable work of sculpture produced by Rebecca Strzelec, she read a poem that came from the opposite: her reaction to the work of art that her poem had helped to create. I loved to hear about this– how the process continued even after the initial prompt. Next up we had a pair of sisters, Nichole Louise & Amy Boone McCreesh, both of whom talked about their work together. Nichole read from her work of historical fiction, and Amy told us about how her sister’s work had helped her create the celebratory piece of art, all colorful and festive before us. 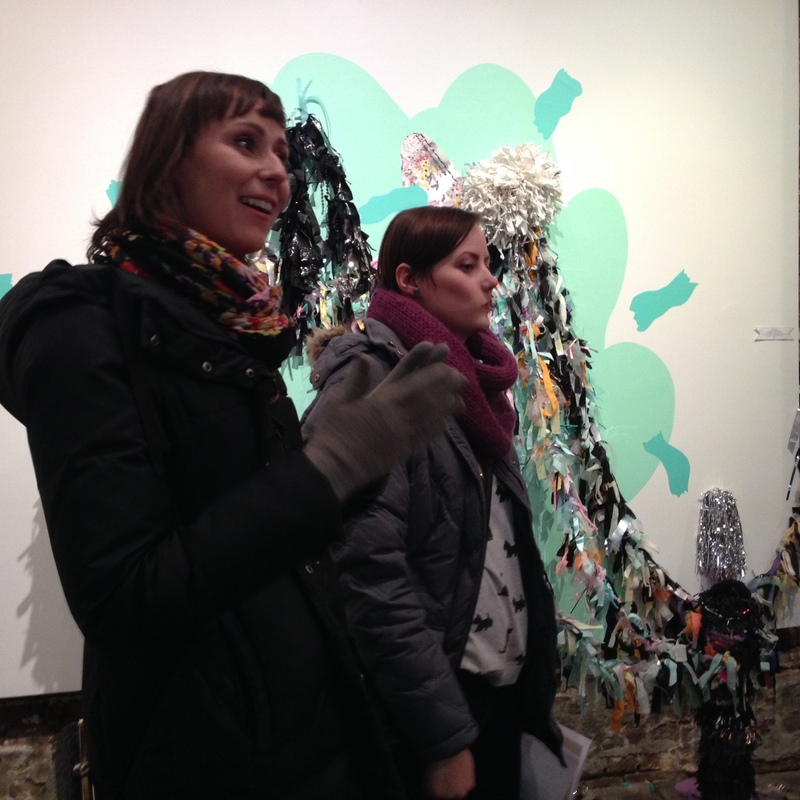 Nichole Louise & Amy Boone McCreesh in front of their piece. The next two people to speak were the artists, as the writers who wrote the “Instructions” for their work were unable to make it to the opening. While Emily Schnellbacher’s piece, inspired by Zoe Meager’s elegant second-person prose was beautiful, almost mummified, and abstract, with a distinctly hard-working yet feminine palette, Caitlin Peck’s work, inspired by Brooke Randel’s “outlined” instructions, was more concrete: the images she chose from the outline were made into what appeared to be “stuffed” versions of normally solid objects. I have never wanted to hug a laptop more. 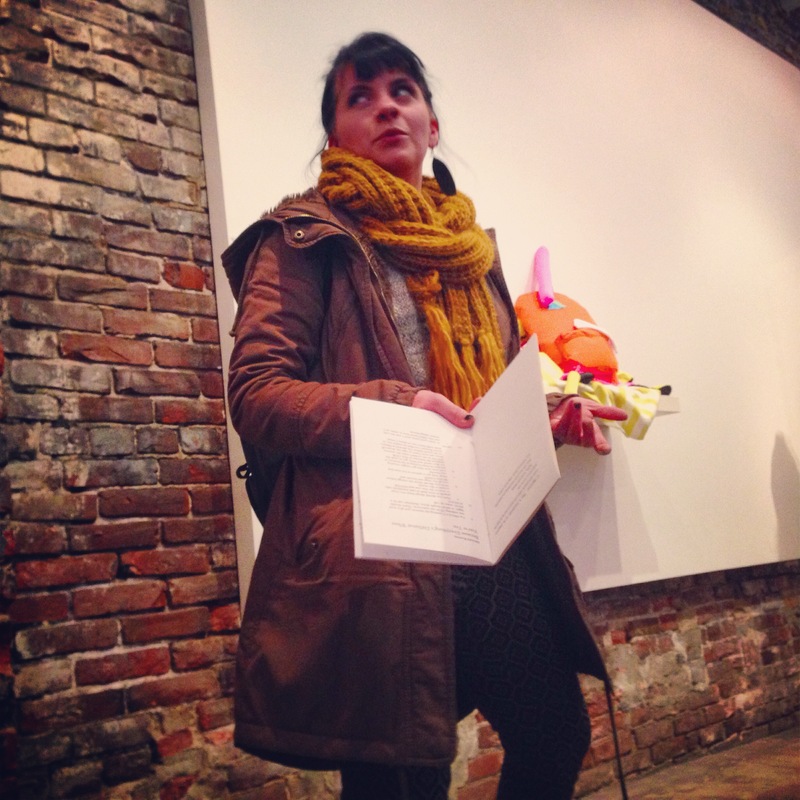 Rachel Milligan read the prose poem that inspired Dylan Pecora‘s piece next. While Rachel’s text is beautiful in a delightfully creepy way, Dylan’s sculpture is creepy in a perhaps strangely beautiful way. Does the skeleton that his work houses serves as a prison or a bed? Somewhere in between? Reread Rachel’s piece and decide for yourself. Last but not least, in the middle of the gallery is the work from Michelle Messina Reale & Carole Loeffler. Carole read from Michelle’s piece and discussed how inspired she was by the piece–she told us how the first time she read it, she was moved by its images and ultimately knew exactly how she was going to “follow” the instructions that had been given to her. The piece looks almost like the bottom half of a wedding dress, bleeding bitten beets. 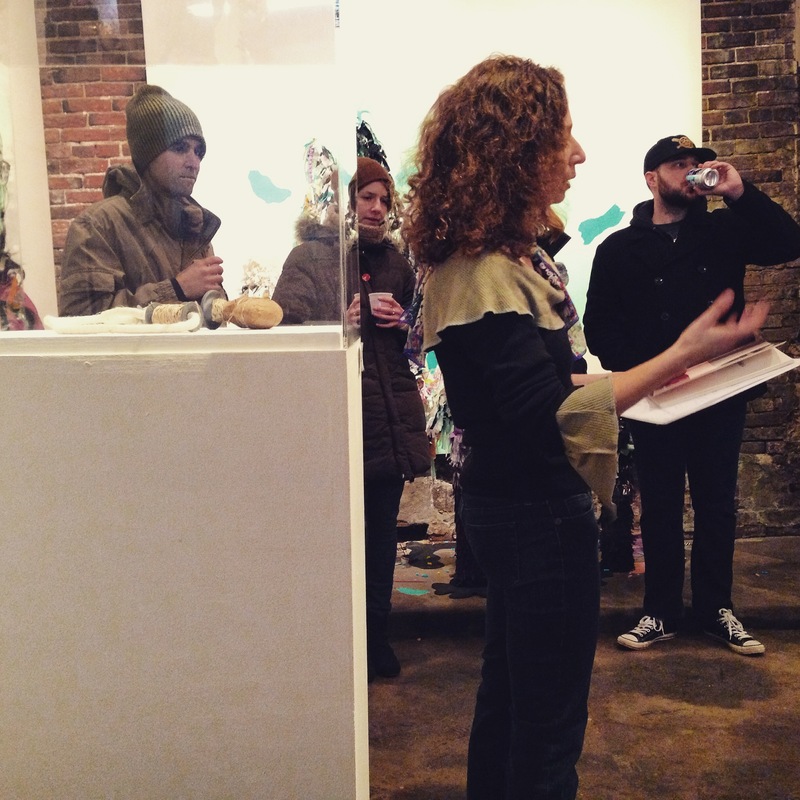 It’s as lovely and strange as the rest of the work this collaborative art/writing show helped to produce. We encourage works of collaboration between writers and artists, between artists and artists, between writers and writers. Work together, make something alive and happen. 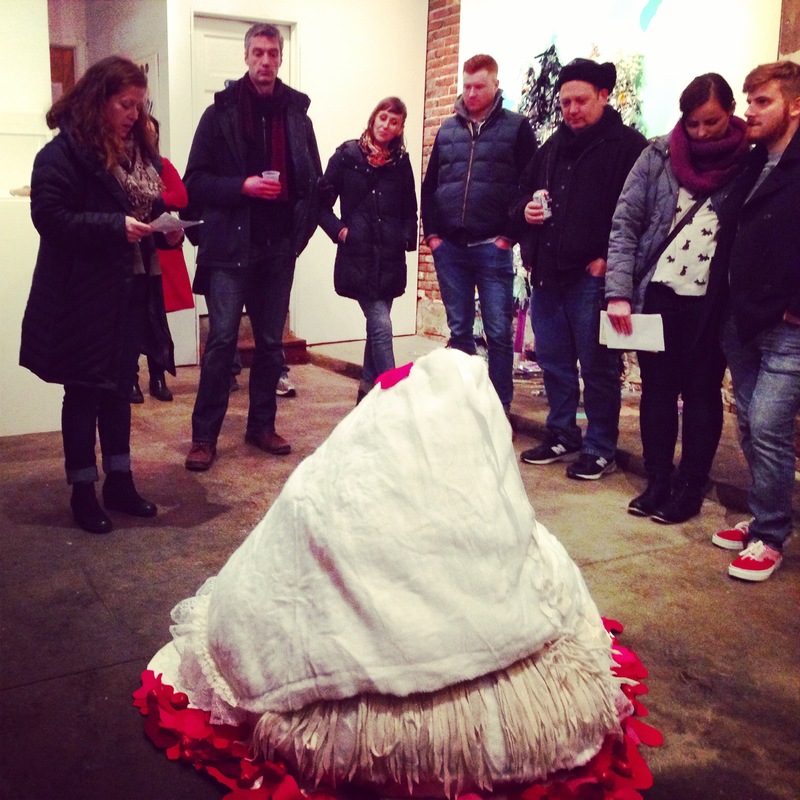 For images and texts from the show, visit the PSG Gallery’s home online. To own a copy of the limited edition chapbook, visit the GS shop online. 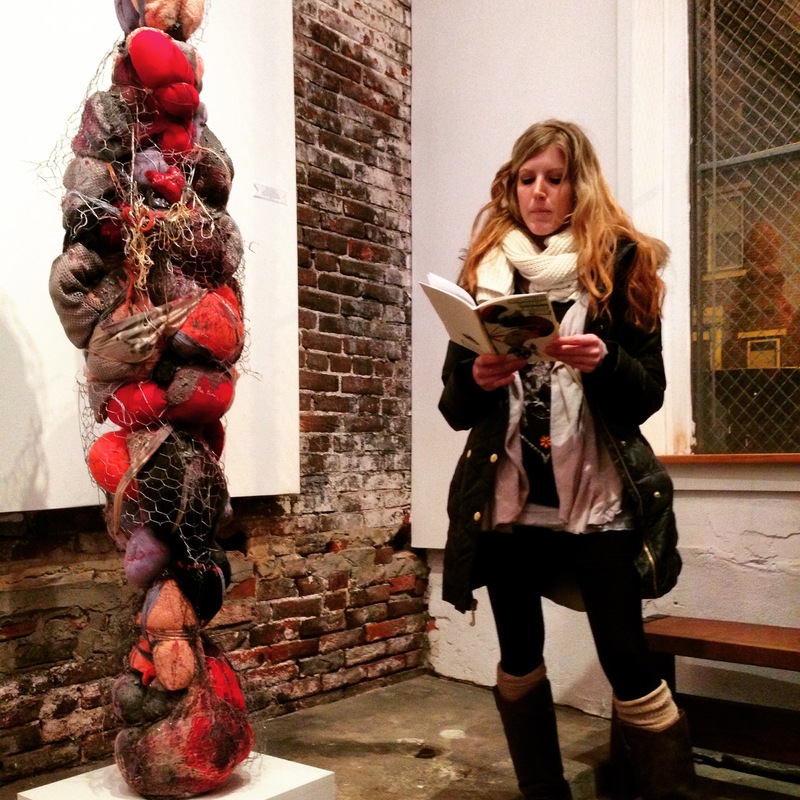 Posted on January 22, 2015 January 22, 2015 by kimannjosouth	This entry was posted in Event Review and tagged art, chapbook, collaboration, gigantic sequins, impossible instructions, literature, philadelphia, philadelphia sculpture gym, sculpture. Bookmark the permalink.